And yesterday, walk she did, with flair and style. Brewer was featured in a simple, beautiful, belted black dress. Carrie Hammer designed the dress with Brewer and Michelle Obama in mind. Brewer walked the runway as part of Hammer’s “Role Models Not Runway Models” show. Hammer started her unique show in 2014 with the goal of showcasing the everyday women who buy her designs. She says that it wasn’t originally “intended to be this incredible statement,” and yet it has turned into one of the brightest – perhaps the brightest – spot in all of Fashion Week. Hammer clearly believes that women with disabilities are part of this everyday woman group and that they, too, deserve to be highlighted and have their moment in the spotlight. So far, Hammer has chosen a woman in a wheelchair, a woman who lost her limbs to bacterial meningitis, and Jamie Brewer. Thank you for being the change that is long overdue. I could literally cry every time I read an article talking about your decision to include a model who just happens to have a disability! YOU are what this world needed! Hammer and Driscoll talked, and Hammer agreed to feature a role model for Driscoll’s daughter, Grace – who also has Down syndrome – in one of her Role Model shows. 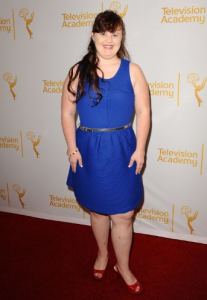 Jamie Brewer fit the bill perfectly. Putting on this show is really exciting for me because it’s redefining the type of model we use on the runway and the type of model women should look up to. No matter our abilities or disabilities, each human being is created beautiful, valuable, and worth paying attention to. Each person is made with inherent value and worth, no matter the differences in our looks, circumstances, or conception. 80-90% of babies with Down syndrome – babies just like Jamie Brewer – are aborted by their parents, often after being pressured by doctors. It’s time we saw beauty and life and value with new eyes. And it seems that – with the help of Carrie Hammer, Jamie Brewer, and Katie Driscoll – New York Fashion Week is getting its own taste of true beauty.